Site visits were conducted at our Swamp Angel Study Plot (SASP) in Senator Beck Basin (SBB), Spring Creek Pass, Wolf Creek Pass, Park Cone, and McClure Pass CODOS monitoring sites (see a map of CODOS sites). Since mid-April we have seen further snowpack development due to a steady series of storm events. Late April and May snow accumulation at higher elevations has done a passable job of keeping majority of dust covered during the clear and sunny skies from May 1-5 and over the last few days (May 11-15). Lower elevations in the San Juan region are seeing dust events #5 and #6 (D5 and D6), and possibly D2-D4, fully exposed on the snowpack surface. The forecast for the Colorado Mountains over the next 4 days calls for at least a chance of precipitation with some locations (Breckenridge, Winter Park) under a winter weather advisory. Today, over the last 12 hours, we have received Storm #24 at SASP. Between April 12 and May 16, SASP has seen 22 days (22 days out of 35) with measurable precipitation. No new dust-on-snow events were observed at our SBB sentry site since the D6-WY2016 event on April 25 (see Dust Log). The total WY2016 mass of mineral dust deposited to-date at the SASP is 11.165 grams per square meter (11 g/m2), approximately similar loadings as WY2011 and WY2012 (see Mass Loading Data). June dust-on-snow events are comparatively rare, but we still have a couple weeks left in the month of May. During this partial CODOS circuit, a merged dust layer sample containing all dust events was collected at Spring Creek Pass, Park Cone, and McClure Pass. Snow profiles were performed at Wolf Creek Pass and SASP. 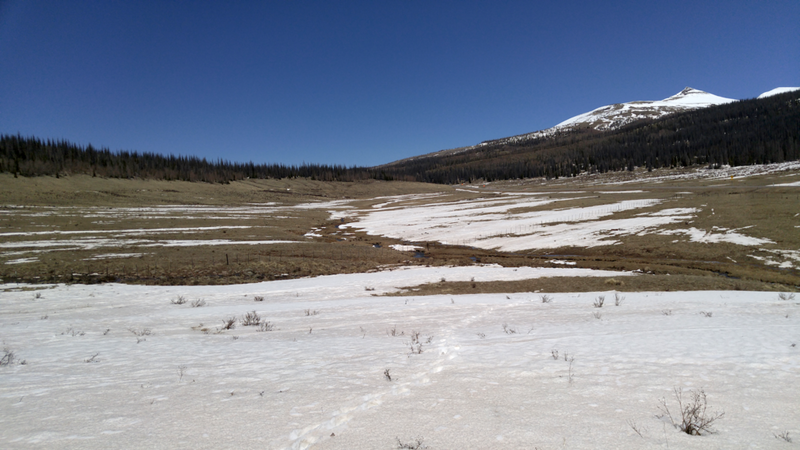 Events D5/D6 were on the verge of emerging, or had emerged, at the snowpack surface at SASP and Wolf Creek Pass. At these two locations, as well as the higher elevations near Spring Creek Pass, the dust can be seen in many areas just below the snow surface. In these areas we observed dust emergence at lower elevations, steeper, exposed slopes, and southerly aspects. At elevation bands near and above treeline, a number of shallow wet slab avalanches ran on the near surface dust layer. The stream of storm events have provided cloud cover along with new snow to assist in keeping the D5/D6 layer somewhat covered at these higher elevations. Near SASP (11,060’) and higher elevations, snow albedo was visibly but not dramatically reduced by the emerging dust. Swamp Angel Study Plot snow profile on May 13, 2016. D5/D6 is 4” below “clean” snow accumulation. Swamp Angel Study Plot on May 13, 2016. D5/D6 is mostly snow covered in similar terrain as that of the study plot. However, where there is slightly less snow coverage or increased exposure, the dust can be seen lying just beneath the surface. Early in the evening May 15 precipitation fell in the form of rain, later in the evening approximately 1.5” of snow accumulated. SBB on May 12, 2016. A number of shallow wet slab avalanches ran Thursday, May 12, on the near-surface D5/D6 dust layer. This elevation band, treeline and slightly above, likely received rain during the precipitation events the first part of last week. Wolf Creek Pass snow profile on May 10, 2016. The merged D5/D6 dust layers are seen as a band 4” below the surface. At the time of the visit, rain-on-snow (which occurred while on-site) had not significantly leached D5/D6 into underlying snow, reducing its visual intensity. Merged dust events D2-D4 are 8“ below surface. The thicker bands below D2/D4 are clear ice. Wolf Creek Pass environs on May 10, 2016. D5/D6 dust events are visible beneath the scant new snow accumulation. Following the taking of this photo, sunny warm weather ensued for 4 days, likely causing dust emergence in this locale to occur quickly. Currently, the forecast over the next five days calls for chance of rain and snow, thereby reducing incoming solar radiation and possibly adding fresh snow on the near-exposed, or exposed dust. Spring Creek Pass on May 12, 2016. Samples of the merged D1/D2/D3/D4/D5 and possible D6 events were collected from the snowpack surface. These concentrated samples are sent to our USGS collaborators for chemical and other analyses, and spatial comparison with these properties at other CODOS sites. Spring Creek Pass on May 12, 2016. Remnants of fresh snow are visible in nearby tracks. Scant precipitation in the form of snow the previous week failed to cover the dust at this locale (see our Storm Reports webpage). Spring Creek Pass on May 12, 2016. Surrounding landscape at Spring Creek Pass CODOS sample site. Near Spring Creek Pass on May 12, 2016. Photo taken of exposed dust on mountain face above sample site. Higher elevations may see a longer period before full dust emergence as field reports have noted snow accumulation of upwards to 2’ at high elevations near Redcloud Peak. Looking toward the vicinity of Park Cone on May 13, 2016. Park Cone SNOTEL on May 13, 2016. Park Cone CODOS sample location on May 13, 2016. Very little snow was present, except in forested, shaded areas. An “all layers merged” dust sample was collected at this location. McClure Pass on May 13, 2016. Looking in the direction of McClure SNOTEL from the typical CODOS sample point. The snow pillow is completely free of snow. McClure Pass on May 13, 2016. Looking towards CODOS sample area. As seen in the plots below, all major watersheds experienced a series of storm events since mid-April that resulted in further snowpack development. Even so, at the 15 SNOTEL sites that CODOS most closely monitors, combined March, April, and May precipitation has fallen short of average at 10 sites, to date (see Mar/Apr/May Precip Variance plot below). These 10 sites, except for Grizzly Peak, are located in the Gunnison, Rio Grande, and Dolores/Animas/San Juan River Basins. Majority of hydrographs since May 1st reflect storm events we received, and subsequent warm/sunny weather. At SASP, from April 15-April 30, we experienced 13 days with precipitation. This was followed by 4 days of warm/sunny conditions (May 2- 5), followed by 5 days of somewhat overcast conditions with precipitation (May 6-10), followed by 4 days of warm/sunny conditions (May 11 – 15). Currently today, we have received Storm # 24 with precipitation likely through Friday. Combined March, April, and May precipitation, through May 15, 2016, has fallen short of average for ten of these fifteen SNOTEL stations adjacent to or near CODOS monitoring sites. As of this writing, Monday, May 16, 2016, the National Weather Service Grand Junction and Denver offices expect another period of significant winter weather today thru Friday throughout the Colorado Mountains with areas near Breckenridge and Winter Park under a winter weather advisory. Below is the precipitation outlook for the next 7-days. In the absence of any further dust-on-snow events in the meantime, the remaining CODOS sites not mentioned in this report will be attended to in latter May or early June. These site visits will be timed to collect as many “all (dust) layers merged” samples at the snowpack surface as possible, and to observe this year’s dust deposition as widely exposed as possible.